We, at Sonokinetic BV, are very proud to introduce Tutti Vox to you and can’t wait to hear the amazing things you, our valued customer base, will produce with it. 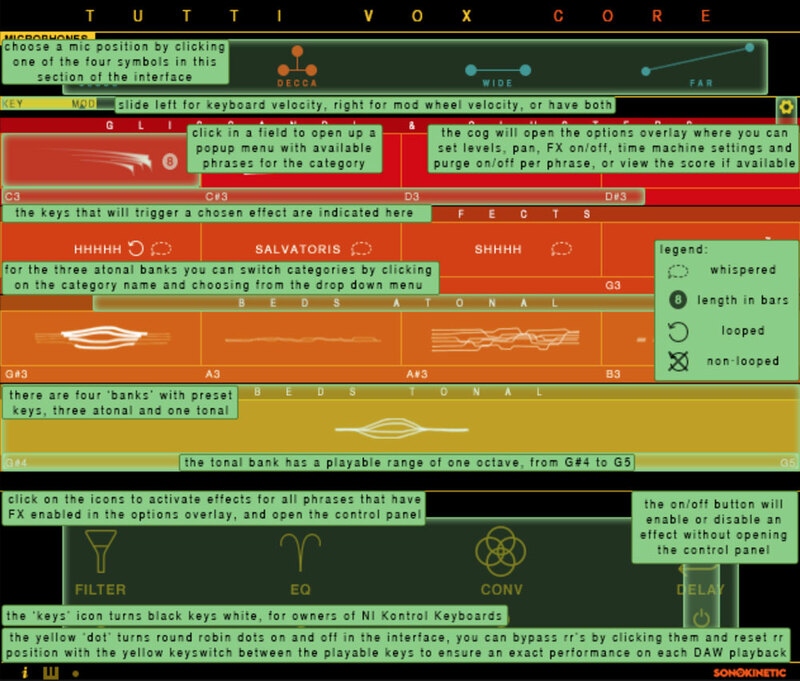 Below is the main interface for Tutti Vox Core. 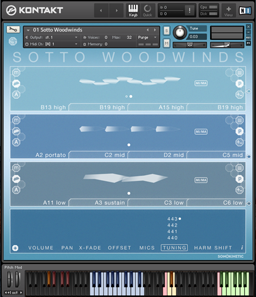 The different coloured banks can be loaded with different types of vocal effects. 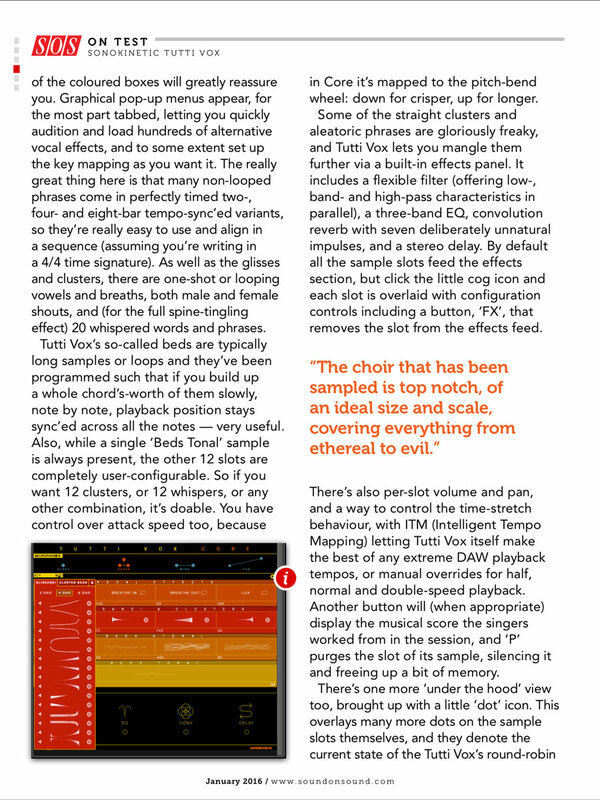 From top to bottom: Glissandi & Clusters, Vocal Effects, Atonal Beds and Tonal Beds. At the top of the interface there are settings for Microphone Position. At the bottom of the interface are FX: Filter, EQ, Reverb and Delay. 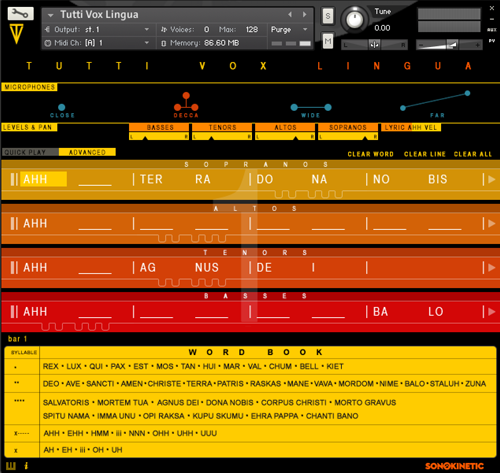 The interface for Tutti Vox Core has 4 differently coloured banks: Glissandi, Vocal FX, Beds Atonal and Beds Tonal.There are 13 fields within these banks, each of which can be loaded with one phrase. These are assigned key triggers, indicated at the bottom of each field. Each field also displays a number of icons which depict different characteristics of the chosen phrase. 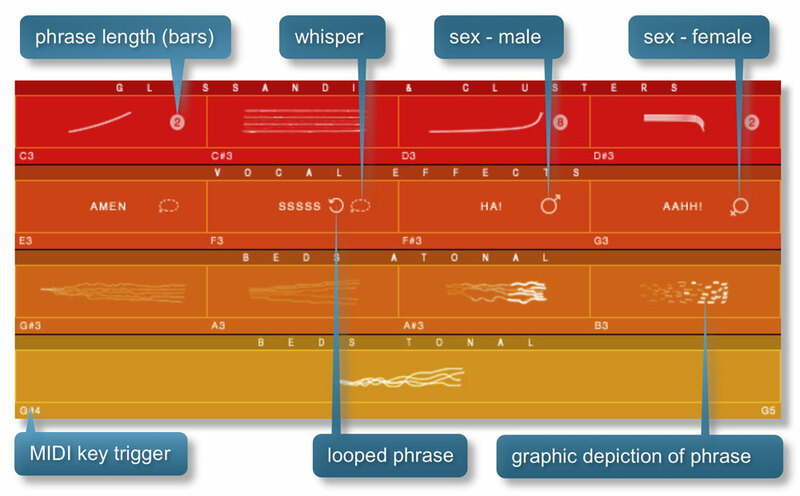 These include a visual representation of the sound, length, looping and gender (depending on phrase chosen). The 4 different banks have different icons, depending on what type of sounds they play. 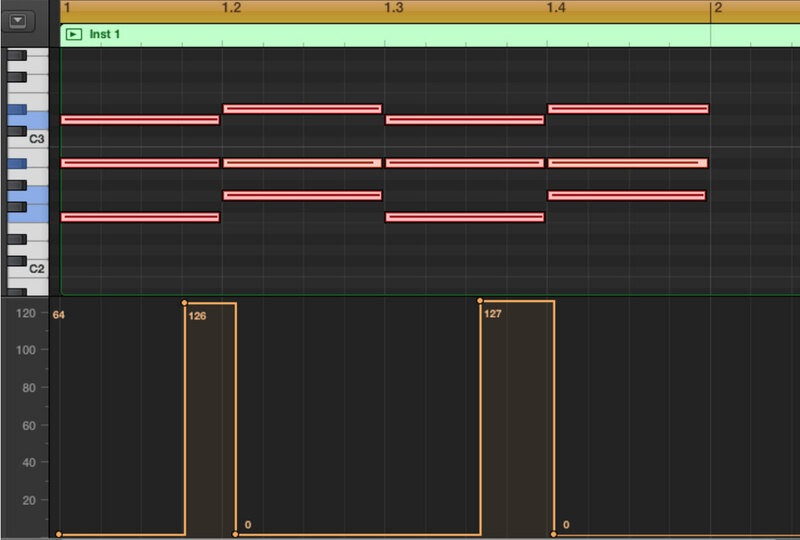 At the bottom of each field is shown the MIDI trigger key for that field / phrase. Click on any phrase graphic to change it. This will open another window, often with several tabs, enabling you to pick a phrase. To the left of each phrase is a small speaker icon which will allow you to preview that phrase when clicked. You don’t have to stick to the standard configurations of banks, set out when you first load Tutti Vox Core. You can change the first 3 atonal banks (Glissandi / Vocal FX / Beds Atonal) to any other bank. Just click in the title line of the bank. This will then open an option for you to choose an alternative bank. Note that the Tonal Beds bank cannot be swapped for any other. This way you could create your own presets or snapshots with just Glissandi across all 12 atonal keys for instance. 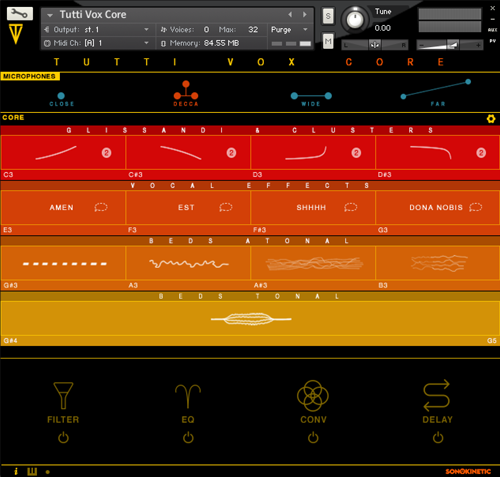 Tutti Vox core is designed so you can easily create impressive cinematic vocal effects. 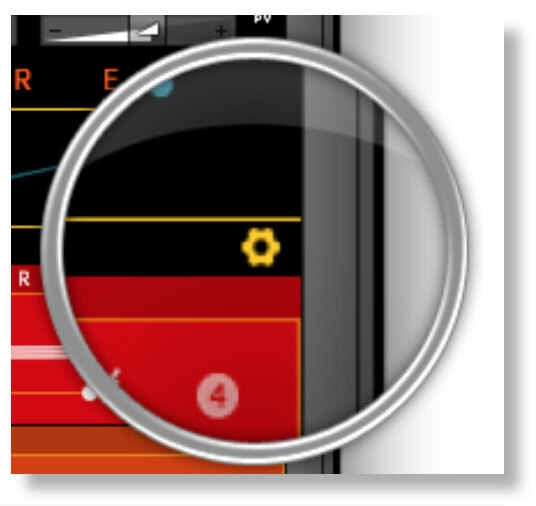 To enhance the on-board performances we have included a comprehensive FX panel at the bottom of the interface. The available FX are Filter, EQ, Convolution reverb and Delay. 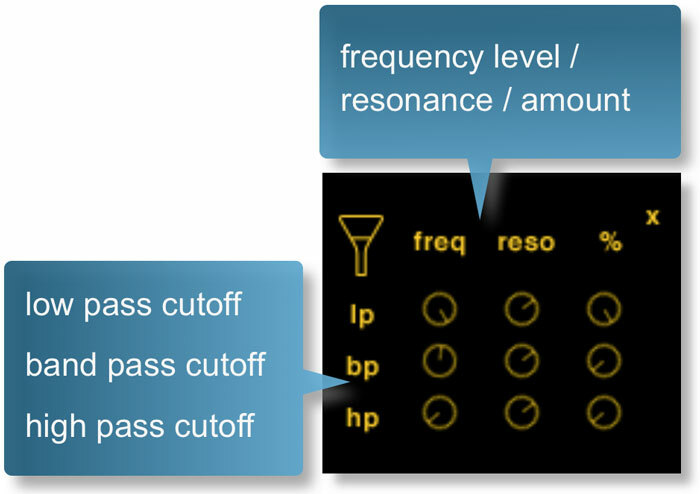 The filter FX option allows you to apply a high, low or band-pass filter to the sound. 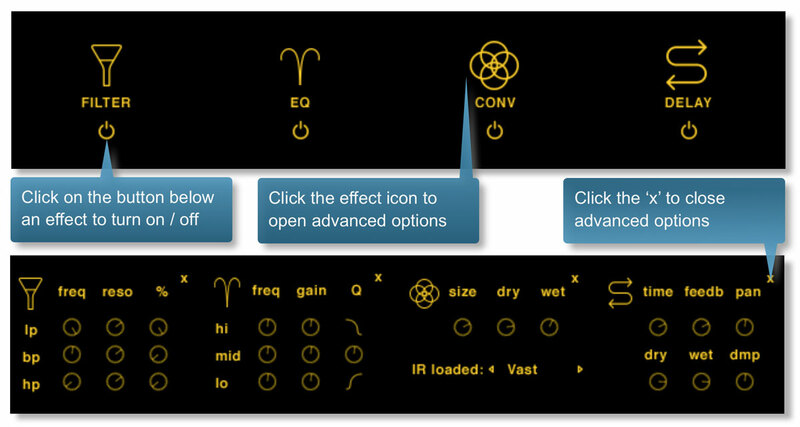 Use the dials to adjust the frequency level, resonance and amount of filtering. Cmd / crtl + click to reset these values to default. 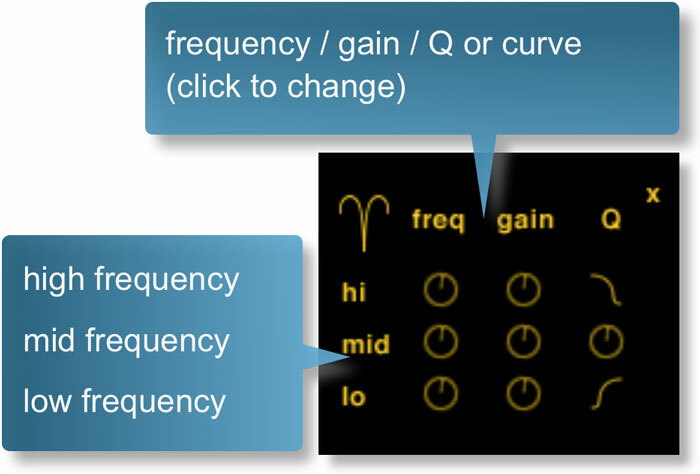 The EQ FX option enables you to shape the frequency characteristics of the sound. There are controls for high, mid and low frequency. For each you can change the frequency, gain and Q level. Cmd / crtl + click to reset these values to default. In addition you can set bell curves for the high and low frequencies. Creative Convolution reverb can be applied here. Adjust the size of the space, dry and wet levels with the dials shown. Choose alternate impulse responses using the left / right arrows. Note that these are creative effect IRs so don’t go looking for your realistic hall here, these are meant to dramatically change the character of the sound in a pleasing way. The delay FX unit enables you add echo and delay to your sounds. Adjust the delay time, feedback level and panning width with the top 3 dials. Dry / wet levels and the amount of damping on the delayed signal is controlled by the bottom 3 dials. 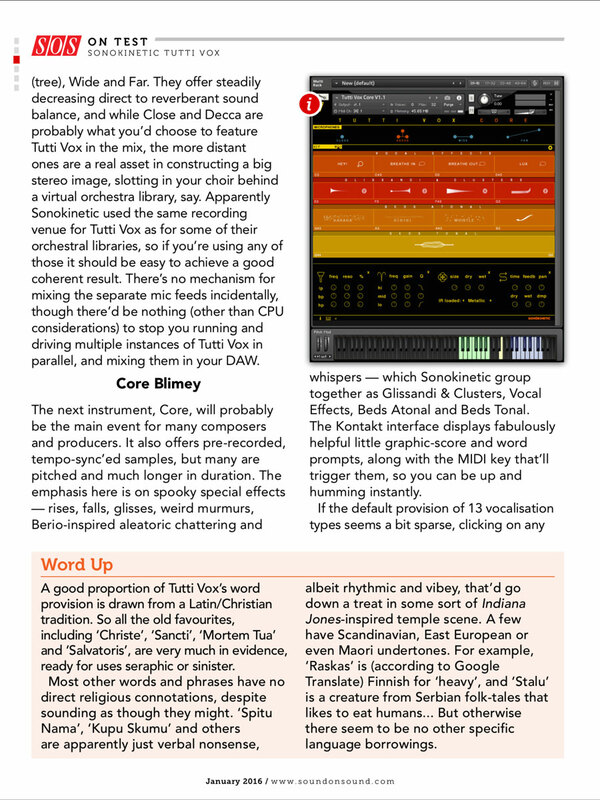 Every phrase in Tutti Vox Core has a number of different ‘takes’ or round robin variations. These normally cycle through, each time you trigger a performance. However, it is possible to gain detailed control over the uses of takes. At the bottom left of the interface, click the takes button, and a set of dots will appear in each field, corresponding to the number of available takes. If you are searching for inspiration and need some suggestions, we’ve included a randomisation option within Tutti Vox Core. Just click on the the O of Vox and the engine will randomly assign phrases to all fields. Clicking the cog graphic at the upper right of the interface will open the options window for all of the fields. 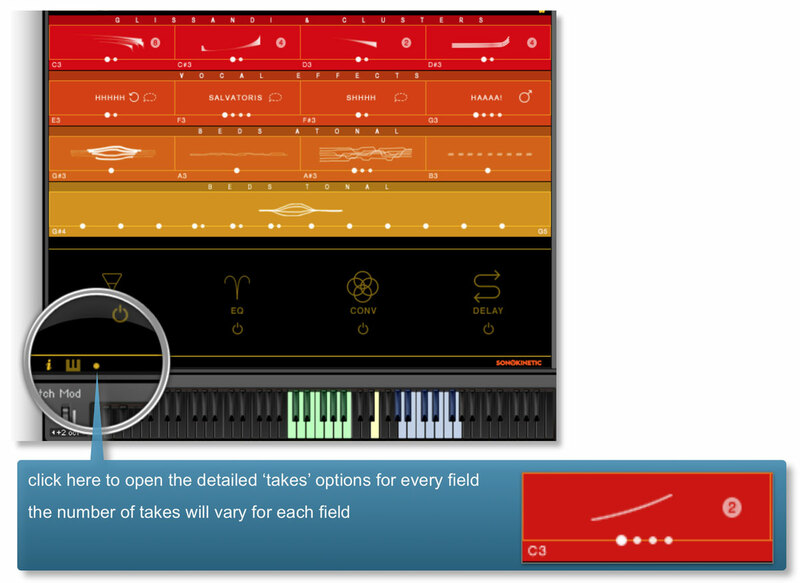 These include controls for Volume, Panning, FX, Speed Control, Purging, Speed Control and Score View. Click the cog icon again to close the options window. 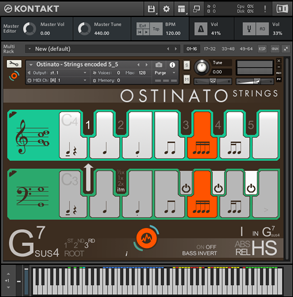 The basic method of playing Tutti Vox Core is to play the green or blue keys indicated on the Kontakt keyboard. The range from MIDI C3-B3 will trigger Glissandi & Clusters, Vocal Effects and Atonal Beds from the 12 atonal fields of the first 3 banks. Playing the key range MIDI G#4 to G5 will trigger the Tonal Beds in 12 different root keys. The keyswitch at MIDI E4 will reset the ‘takes’. With Tutti Vox Core, the pitch bend wheel of your MIDI keyboard will not control pitch. Instead, it controls the attack length of the phrases. Push the wheel up to increase the attack length, pull down to decrease. The central position sets a slight attack curve which works well for most words. If you wish, you can also assign the attack length to an external MIDI controller. There is a hidden control on the T of Tutti. right-click it to ‘Learn MIDI’ from an external controller. Using an external controller has the added advantage of being able to leave the pitch well in a position without it jumping back to center, and if you are using a foot controller for this, it will also free up your hands. Experiment with playing sustains, playing the first one with the pitch wheel in central position, and slide it up for any notes you add. You can create beautiful evolving textures that way. 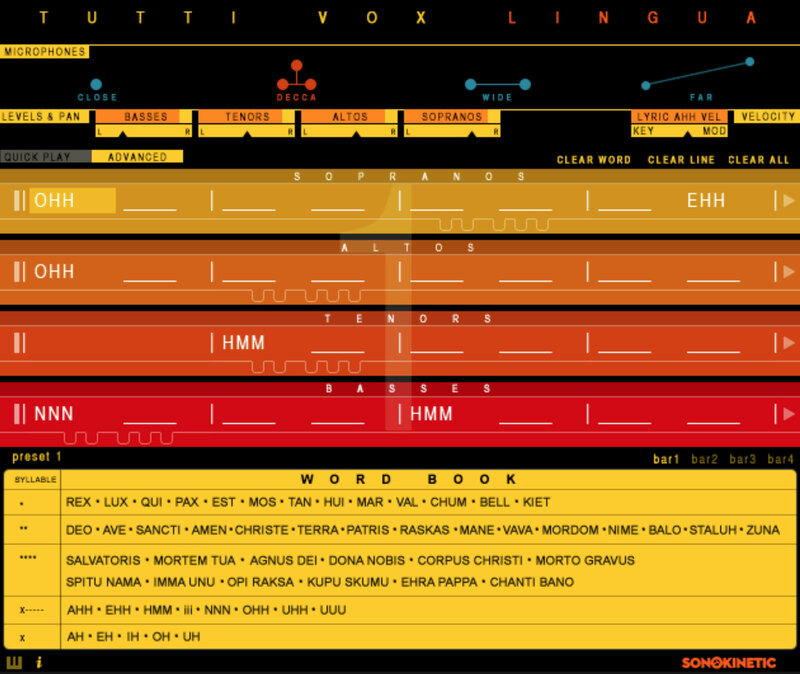 Tutti Vox Lingua allows you to construct complex phrases, constructed from shorter sounds and words. The functionality is comprehensive and as such the instrument is split into two distinct modes: “Quick Play” & “Advanced”. Less control over choir sections. Create sequenced patterns up to 4 bars long. More control over choir sections. 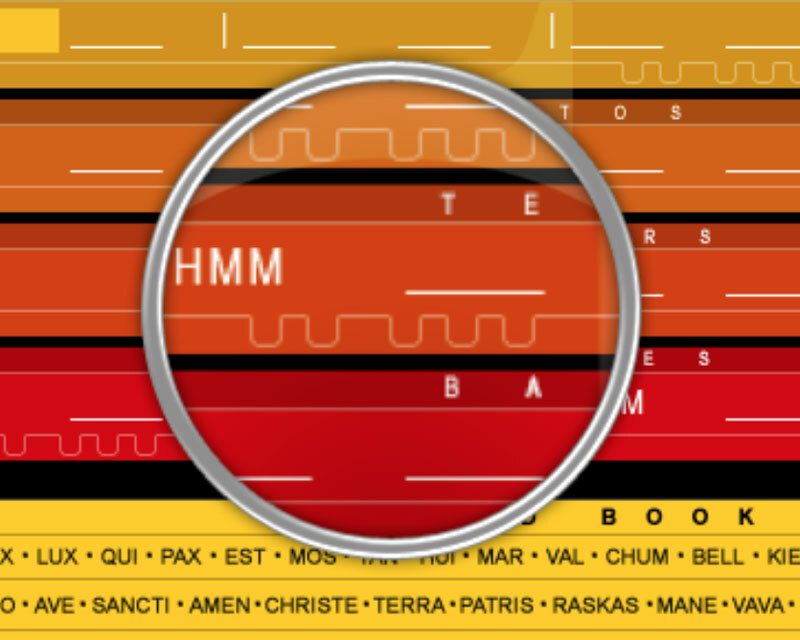 Choose words from the word book to populate the fields in Tutti Vox Lingua. 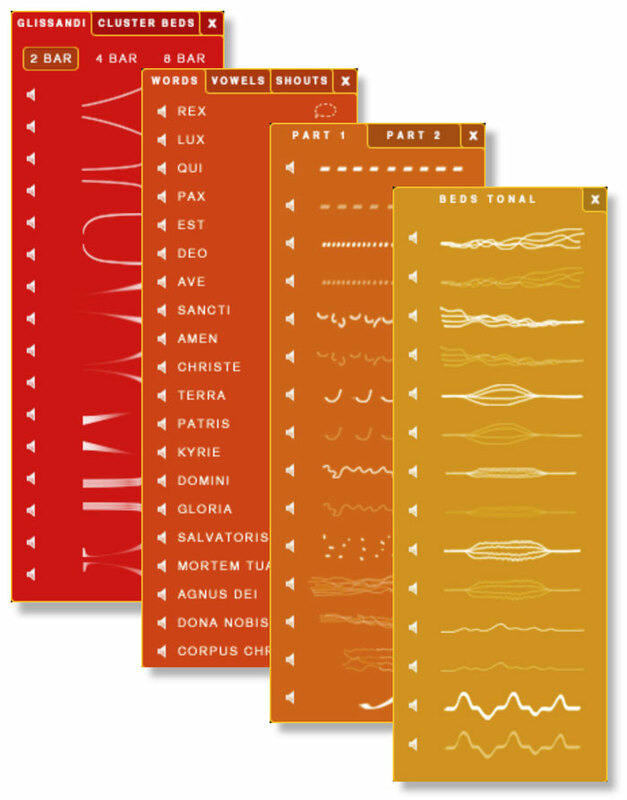 Adjust the choir section volume levels and panning with these controls. Click and drag to operate. Cmd / ctrl + click will reset them to the default values. Use the pitch bend wheel to change the attack length of these sounds. Push the wheel up to increase the attack length, pull down to decrease. The central position sets a slight attack curve which works well for most words. One particular word seems to get a lot of use in film scoring and that’s “Ahh”. 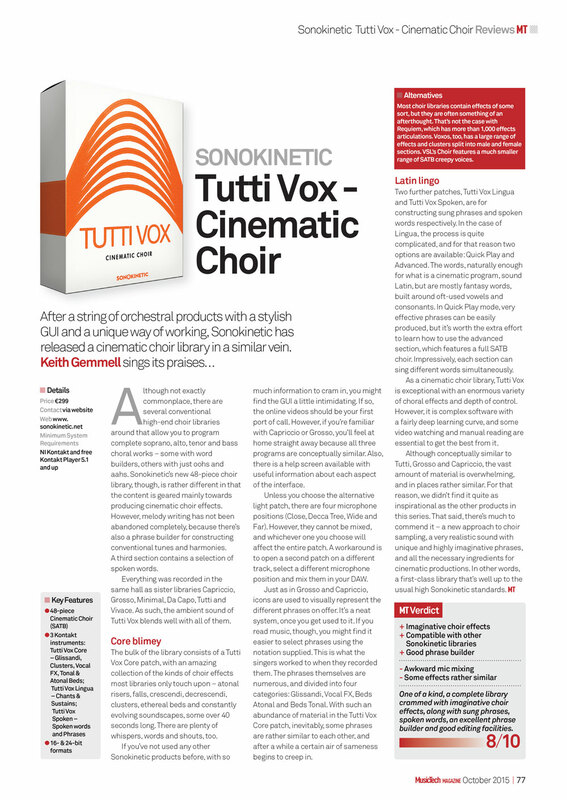 With Tutti Vox Lingua you have control over two different soprano and tenor “Ahh” sounds: one softer and one with a lyrical vibrato which has a far stronger sound. These two sample sets are velocity sensitive and the cross-over velocity value where one switches to the other is user controlled. Set it by dragging this slider. Cmd / ctrl + click to reset to the default value. Bear in mind that this velocity level recognised by this slider is dependant on velocity level data sent by either by the MOD wheel, key velocity or a combination of both (depending on the user setting). In the same way as Tutti Core, it’s possible to randomize the words in the fields. In Lingua this will apply to just 1 preset of the available 4, so as not to fill your available RAM with one click. Click the O of Vox to sign random words to the fields. 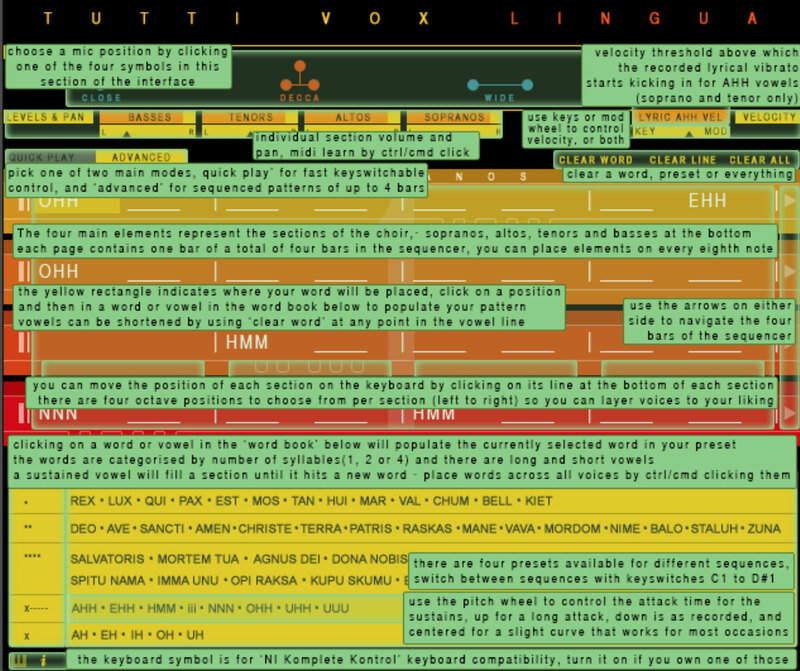 This is the main interface for the Tutti Vox Lingua - Quick Play. 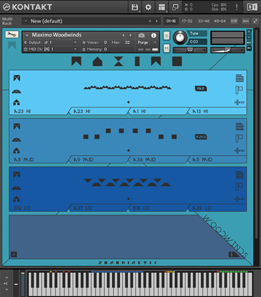 The instrument has 4 presets shown here. They can be selected within the interface, where when one is clicked upon, it will expand. The presets can also be selected by using the keyswitches from MIDI C1 to D#1. Each of the 4 presets has 8 fields, each of which can contain a word. These are arranged horizontally across the UI. Only 4 words can be displayed at once. To access the other words, click the arrow to the far right of the interface. To go back click the arrow to the far left. 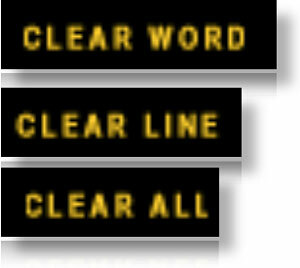 The currently selected word is highlighted in yellow. If there are already words loaded to the fields, you can also skip to a word/page by using the Phrase keyswitches from C0 to G#0. To program the presets, simply select one and then click within one of the fields. Then select a word from the Word Book at the bottom of the interface - you will see that word appear in the field. Underneath the preset fields is a toggle control for playback. When a word is triggered the engine will “skip” playback to the next field when all keys and the sustain pedal are released. The engine will not “skip” - switch between words by using the phrase keyswitches (horizontally) or the preset keyswitches (vertically). NOTE: If any of the fields are blank and do not contain a word, the automated playback engine will skip them and move on to playback of the next word. 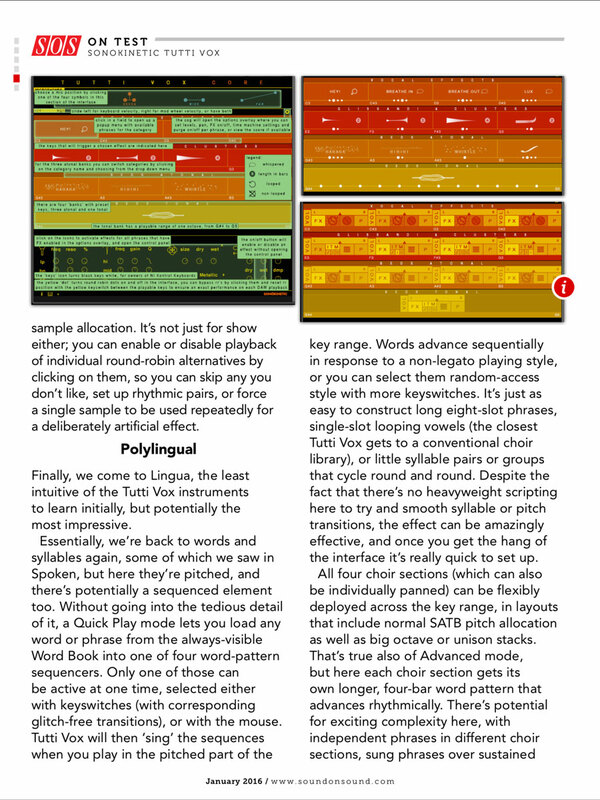 If you haven’t already, familiarise yourself with the “Quick Play” setting in Tutti Vox Lingua. The “Advanced” page that will be covered here builds on many of those concepts. 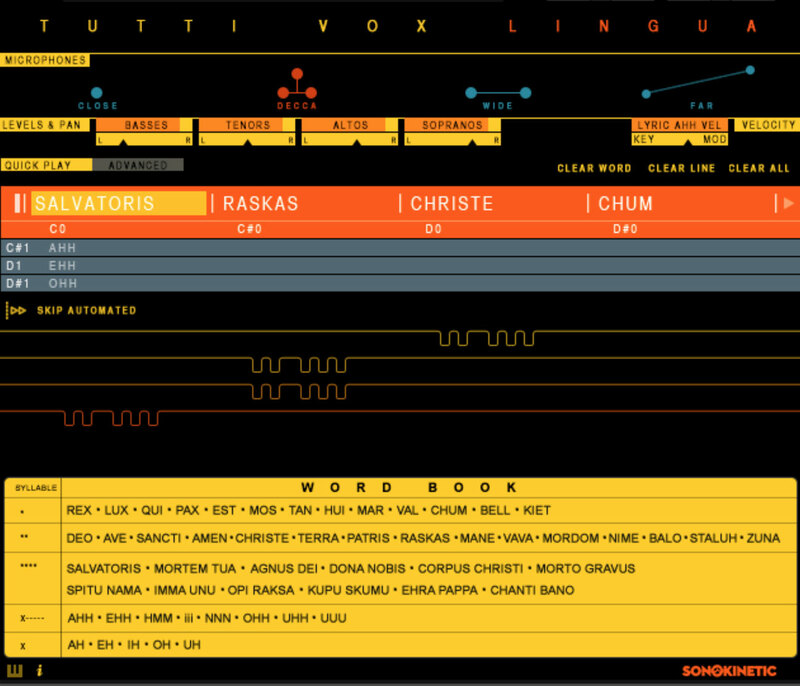 This is the main interface for the Tutti Vox Lingua - Advanced. The 4 main elements (coloured from yellow through red) represent the 4 sections of the choir. From top to bottom soprano, alto, tenor and bass. Each field represents one syllable. In the same way as “Quick Play” you can click the words in the word book to fill the fields. With advanced mode, different words can be assigned to each section of the choir, if you so wish. 4 bar phrases can be built up, using the fields. Only 8 syllables (which constitute 1 bar of music) can be displayed at once in each of the 4 sections. To access the other bars, click the arrows to the far right of the interface. To go back click the arrows to the far left. 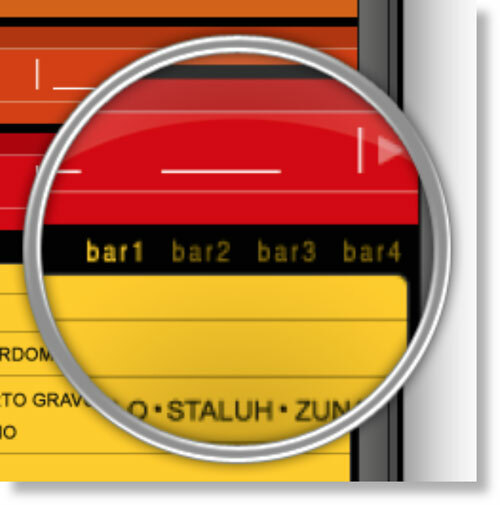 You can also select the bars using the 4 bar icons shown here. 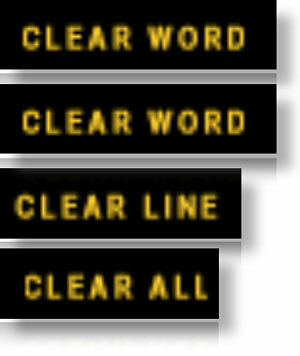 The currently selected syllable is highlighted in yellow. To program the fields, simply select one and click. Then select a word from the word book at the bottom of the interface - you will see that word appear in one or more fields (depending on how many syllables the word has). Keyboard mapping for Advanced works in the same way as for Quick Play. 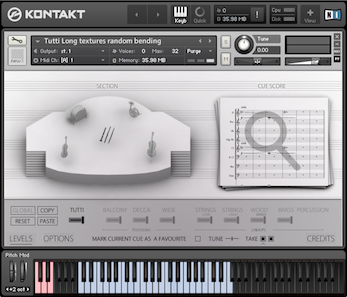 However, due to space constraints within the Kontakt interface, each section of the choir (soprano / alto / tenor / bass) has a mapping control graphic within it. Click them in the usual way to change the keyboard mapping. 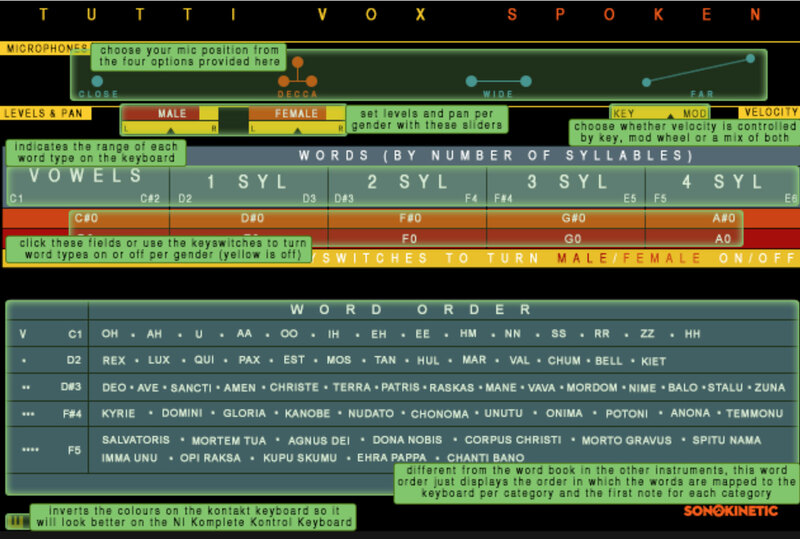 The positions of the playable keys for Tutti Vox Lingua completely depend on where you have set them on the interface. The keys are coloured so that you can recognise the 4 different choir sections. Note that ranges for vowels are larger than for words. Choose the 8 fields within each preset with MIDI key switches C0 to G0 (Quickplay only) - Note that these field key switches will only be coloured if the field is populated with a word. Use the sustain pedal in the same way as you would do with piano playing, to sustain a note until release. Creative use of the sustain pedal means that you can change a note or chord part way through the playback of a particular word. This gives Tutti Lingua even more flexibility. Using the sustain pedal as shown here will mean that the second two syllables of both SALVATORIS and CORPUS CHRISTI change to new chords, within the playback of the words themselves. This will also happen when you play legato without use of the sustain pedal, but using the pedal it is easier to change between larger or non-connected chords. For more information about this aspect of Tutti Lingua, refer to the Tutti Lingua tutorial video supplied with your copy of the software. In addition to the two sung patches, “Core” and “Lingua”, we have also designed a patch dedicated to spoken words named “Spoken”. The UI and functionality of the Spoken patch is very similar to that of the others. There are some differences: As the words are all spoken, rather than sung and there is no provision for root pitch and we were able to map all of the words to the keyboard for instant access. The sections are split between male and female, rather than choir sections. 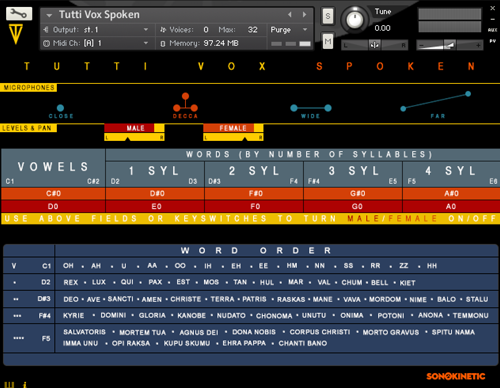 This is the main interface for the Tutti Vox Spoken instrument with controls for microphone placement, levels, panning and muting / unmuting the male / female sections. Adjust the male and female volume levels and panning with these controls. 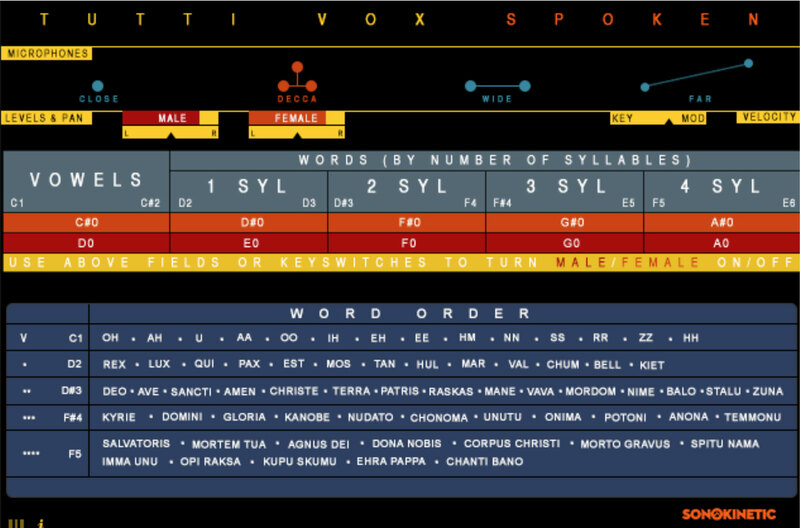 Playing Tutti Vox Spoken is similar to playing Tutti Vox Lingua, except that all of the words are mapped and can be played directly from the keyboard, without loading them into fields. The 2, 3 & 4 syllable words respond to tempo in the same way as Core and Lingua. With Tutti Vox Spoken the pitch bend wheel gives you control over the sample playback speed of the words. If you wish, you can also assign sample speed to an external MIDI controller. There is a hidden control on the T of Tutti. right-click it to ‘Learn MIDI’ from an external controller. 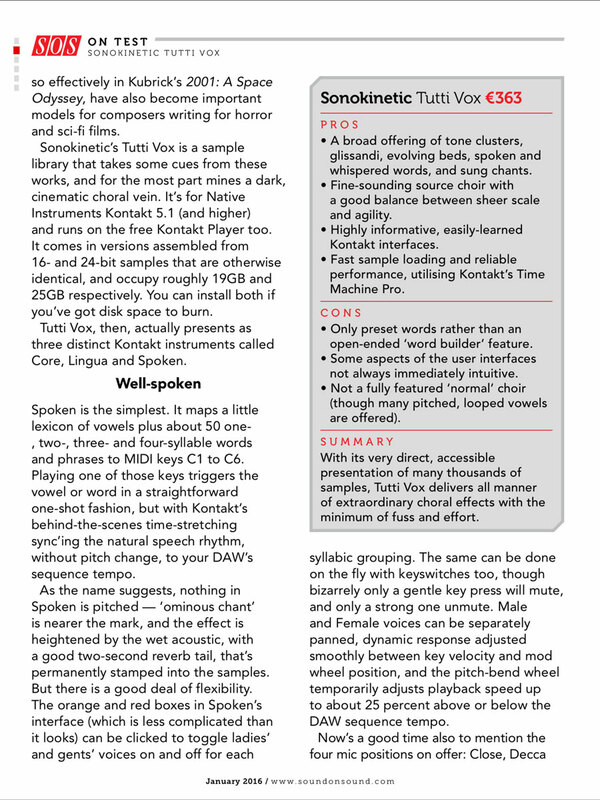 Tutti Vox is really 3 different instruments in one package. All 3 instruments have lots of options for customisation and as such their interfaces may at first be a little overwhelming. However, we’ve produced a detailed manual and several videos to get you up and running as quickly as possible. 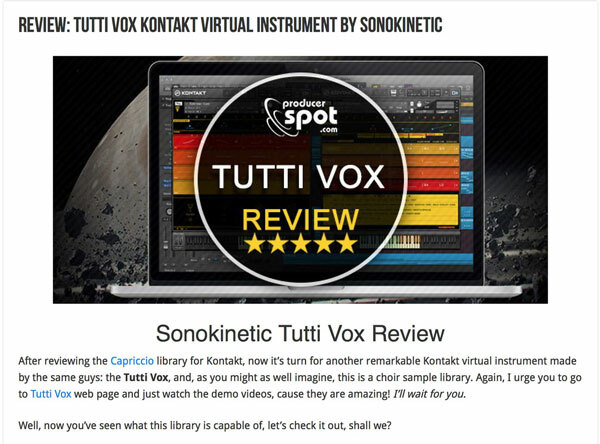 If you’re completely new to Sonokinetic instruments we’d recommend you get started with Tutti Vox by watching the Overview and Essentials videos either online or found in the videos folder supplied with your copy of Tutti Vox. These two videos will give you an overview of what these instruments are capable of. There are 3 more videos that specifically cover each Tutti Vox instrument in detail. Once you’ve watched these, read the manual carefully to make sure that you’re getting the most from Tutti Vox. 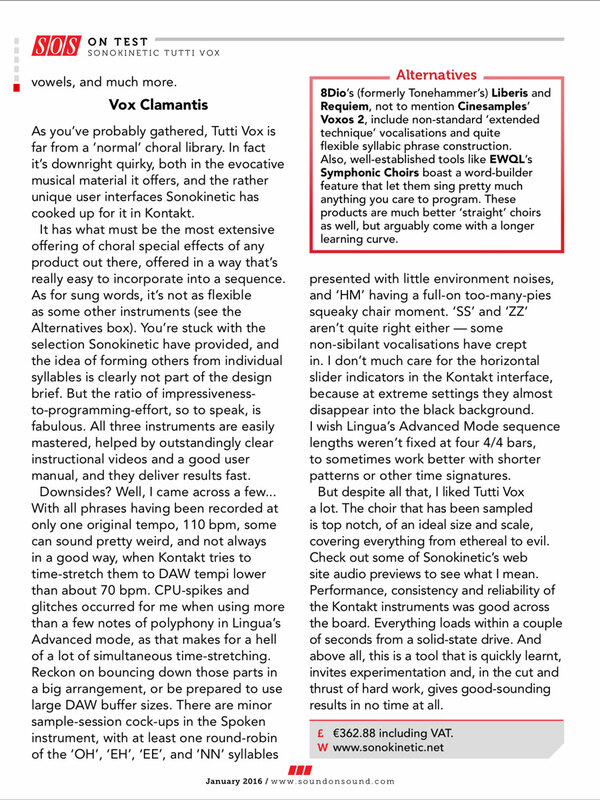 If you’ve previously used a few other Sonokinetic products you should feel right at home with Tutti Vox. 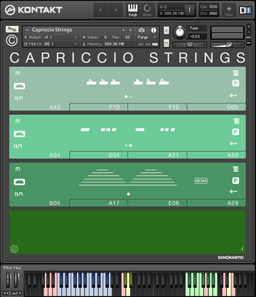 Users of our prior libraries such as Capriccio and Grosso may feel particularly comfortable with diving straight into Tutti Vox as many of the concepts are similar. 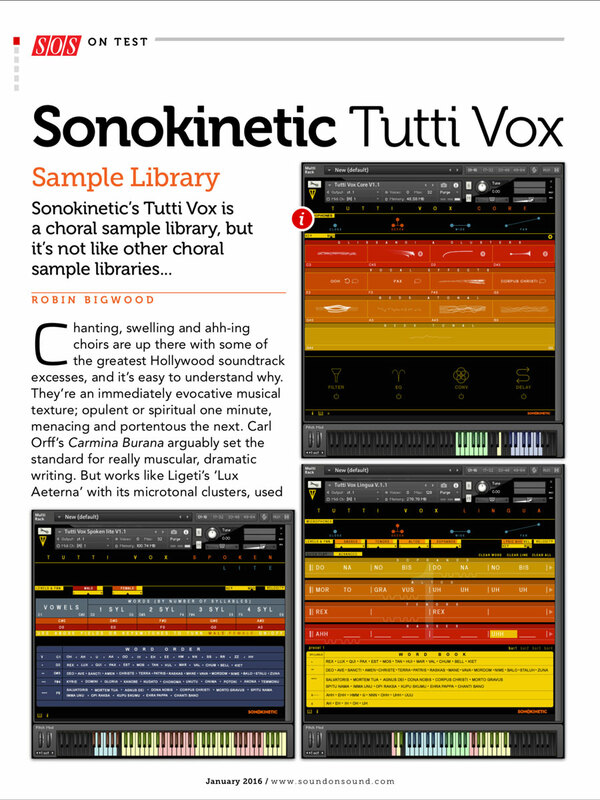 Nevertheless, there are lots of new and exciting features and innovations within Tutti Vox so take the time to read the manual and watch the tutorial videos. This will ensure that you get the most from Tutti Vox. 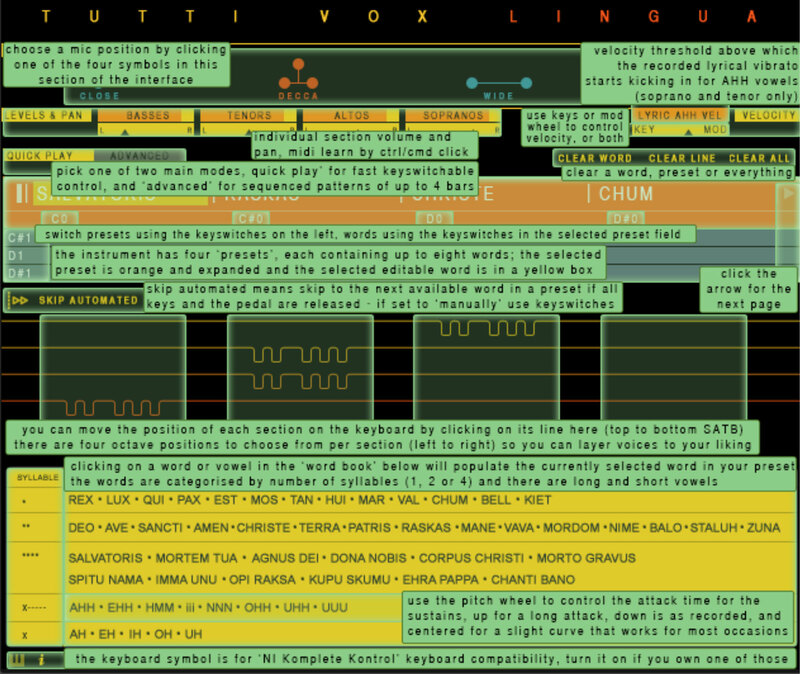 Click the ‘i’ icon at the bottom left of the interface to bring up a handy information help screen for each of the 3 instruments, explaining the functions and buttons of Tutti Vox. Those are C, Eb and Ab for the major ones, and Cm, Em and Am in the cases where a minor version was needed.